With immediate effect, there is no access whatsoever to Barrow No.3 tank... that's the big one on the north-west side of the A38. Major engineering work has started, and is scheduled to last at least a year. Due to the scale of the work, there will be no entry to anyone at all until it is complete; the site has now been handed over to contractors and is closed. The only way to view is from the side of No.2 tank, which although not particularly good, is better than nothing. It's not anticipated that there will be a need to drain the reservoir though, so no amazing spring wader passage. The Yellow-browed Warbler was seen at 11:00 behind Stratford hide, and one Mediterranean Gull was seen in the roost. Thirteen Snipe were seen in front of Stratford hide this morning (no Jack Snipe), and three Mediterranean Gulls were in the roost this afternoon. The Yellow-browed Warbler showed well behind Stratford hide late this afternoon. Two Marsh Harriers were seen this morning - unfortunately neither lingered. The Yellow-browed Warbler showed again behind Stratford hide. The Spotted Sandpiper was seen on Stratford Islands today, along with a Common Sandpiper - the latter being extremely rare at Chew in the winter. An Iceland Gull was reported in Heron's Green Bay late this morning, but it flew towards Stratford Bay and wasn't relocated. The Egyptian Goose was also seen in Heron's Green this morning. The Spotted Sandpiper was back on the causeway at Herriott's Bridge today, and the adult Ring-billed Gull was again at Woodford Bank. The gull roost was very close off Nunnery Point this afternoon, but only produced an adult Mediterranean Gull and an unusual adult Common Gull which, at rest showed white primaries. Perhaps there was a hint of black showing through on one or two of the tips, a bit like an extreme second-winter Med Gull. Also seen today were ten Pintail, seven Goosander, 31 Shelduck and three Little Egrets. The Ring-billed Gull was still at Woodford Lodge today, and the Yellow-browed Warbler was seen behind Stratford hide at 16:00. The Spotted Sandpiper was also seen from Stratford hide, at the southern end of Moreton Bank. Two Whooper Swans on Herriott's Pool today were the highlight; this species has now been seen each year since 2008. The Spotted Sandpiper remained. 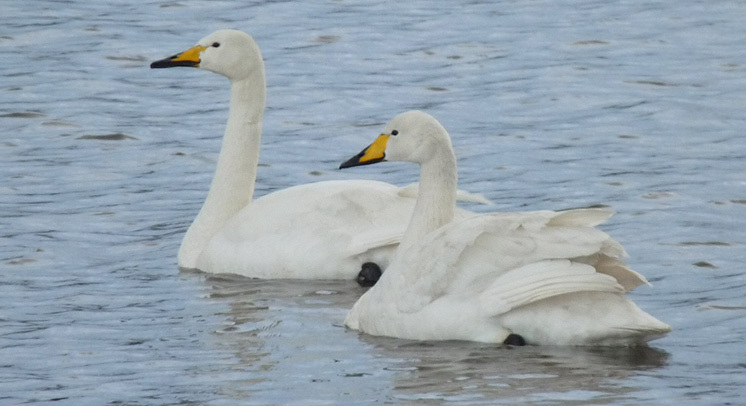 The two adult Whooper Swans on their brief visit to Herriott's Pool this afternoon (Nigel Warren). The Spotted Sandpiper and Ring-billed Gull were both reported as still being present today, and the Yellow-browed Warbler was seen again briefly mid-morning in the alder wood behind Stratford hide. One Jack Snipe and a Common Snipe were on the pool in front of the hide, and an adult Mediterranean Gull was seen in the roost. There were still up to ten Bullfinches at Woodford Lodge car park. The Yellow-browed Warbler was seen again briefly, four times behind Stratford hide at about 13:00. In front of the hide were two Jack Snipe and 16 Common Snipe; a male Greater Scaup was at Moreton and the adult Ring-billed Gull was still at Woodford Bank. The Yellow-browed Warbler put in reappearances at 13:00 and 15:15 this afternoon, in sallows behind Stratford hide. The adult Ring-billed Gull was still at Woodford Lodge today. The Spotted Sandpiper (Herriott's Bridge) and Ring-billed Gull (Woodford Bank) were both seen again today. The Ring-bill's tolerance of human presence might be explained by the fact that it has a nasty gash on its wing - you can see in Gareth Jones' photo just here. On the other hand, it might be that all Ring-bills are just greedy. A few people have remarked on the visibility of Bullfinches locally this winter, and a flock of c.30 at Woodford Lodge today was very likely the biggest count ever made at Chew. Also seen today were two Bewick's Swans (Herriott's Pool), a male Greater Scaup, a Jack Snipe and a Slavonian Grebe (Stratford Bay). 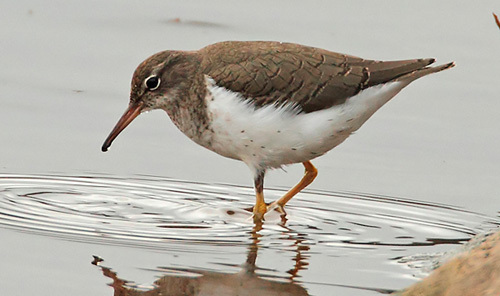 The Spotted Sandpiper is having to make do with picking flies off the causeway at Herriott's Bridge now that the rising water level in the lake has covered all the muddy bits (Gary Thoburn). The Spotted Sandpiper was reported again at Herriott's Bridge this morning, and the adult Ring-billed Gull was typically accommodating at Woodford today. A Little Gull flew over Herriott's Bridge into the roost this afternoon. 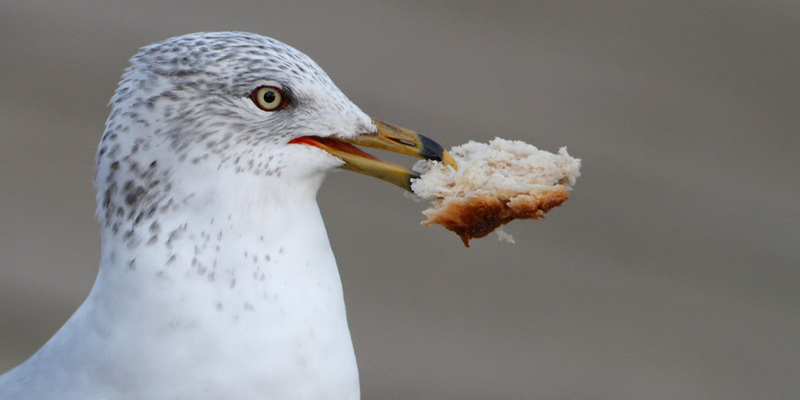 For some reason the Ring-billed Gull at Woodford Lodge has a loaf-shaped neck. The Ring-billed Gull was seen again at Woodford Lodge/Bank, and two Jack Snipe were on the pool in front of Stratford hide. What was either an Arctic or Pomarine Skua was seen high over the lake at 15:35. The recent rain has raised the water level to all but cover the little muddy spit at Herriott's End favoured by the Spotted Sandpiper; it couldn't be located this afternoon. The adult Ring-billed Gull (Woodford Lodge) and Spotted Sandpiper (Herriott's Bridge) were both still present today. The Ring-billed Gull this afternoon (Andy Davis). 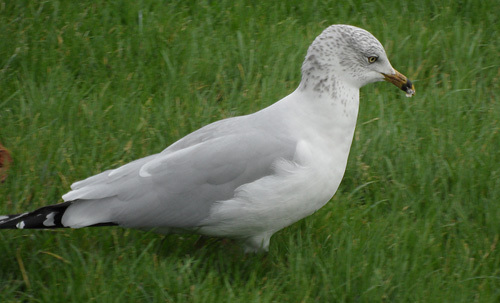 An adult Ring-billed Gull was a surprise find walking about on the lawn at Woodford Lodge this afternoon; it eventually flew down to the pontoon off the Sailing Club. The Spotted Sandpiper was again at Herriott's, either in the channel on the north side of the bridge or on the pool itself. A first-winter Kittiwake was also seen there. A first-winter male Greater Scaup was seen off Moreton Bank (from Stratford hide). SUNDAY 1st Happy New Year!! If 2012 is going to follow last year as being one of top drawer birding, then a Yellow-browed Warbler at the ringing station this morning was a pretty good way to start. Strictly speaking, it's a 2011 bird hanging on, as it was first seen last Thursday, but for 'technical reasons' it wasn't identified until today. That's the fifth YBW to be found at Chew. The Spotted Sandpiper was still at Herriott's End this morning, again where there remains a small area of mud and vegetation on a spit north of Herriott's Bridge, just beyond the end of the reedbed on the west side of the channel. It's only visible by viewing from the footpath a few metres to the right of the bridge parapets. If the water level continues to rise as it has done in recent days, I suspect this bit of mud will be underwater soon; it'll either have to eke out a living back on the concrete parts of the bridge or find somewhere else. Also at the lake today were two Bewick's Swans and a Little Egret (Villice), a male Red-crested Pochard and male Ferruginous Duck x Pochard (Moreton), and a female Greater Scaup and a male Lesser Scaup-type hybrid (Stratford Bay). A Bittern was seen at Herriott's Bridge this morning. The Yellow-browed Warbler in the hand this morning.